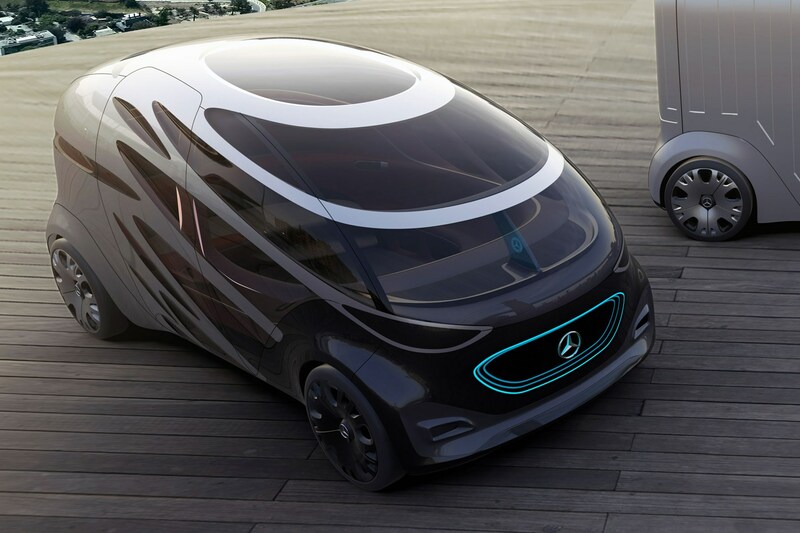 In today’s world where technology has a tendency to make significant strides every week let alone every year, trying to predict what urban transport solutions might look like in two decades’ time sounds fanciful – but that’s exactly what Mercedes-Benz claims to have done by revealing this concept van called Vision Urbanetic. You won’t be surprised to learn that not only is the Vision Urbanetic fully electric for zero-emission driving in cities, it’s also fully autonomous with no controls for a driver to operate it. 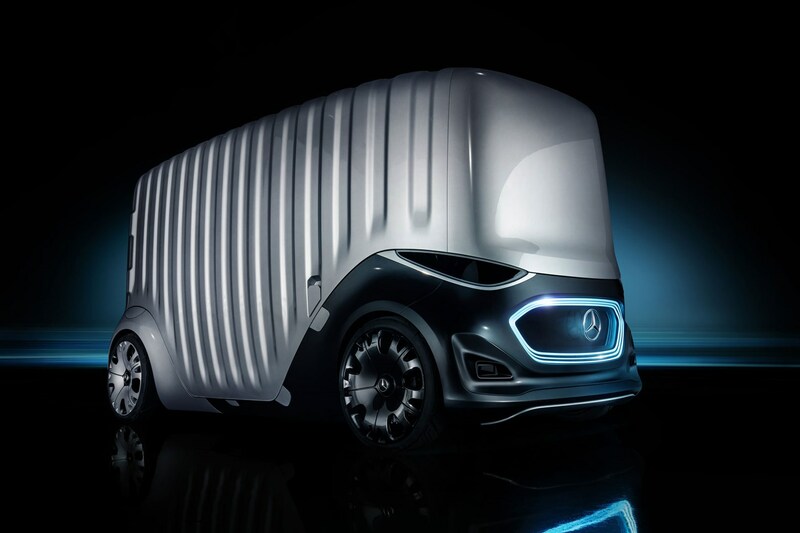 What’s more intriguing is that the bodywork pod can be switched from a boxy van to a people-moving configuration, both fitting onto what Mercedes calls a skateboard chassis, while its intelligent telematics learn about its specific environment predicting when demand will be at its highest. 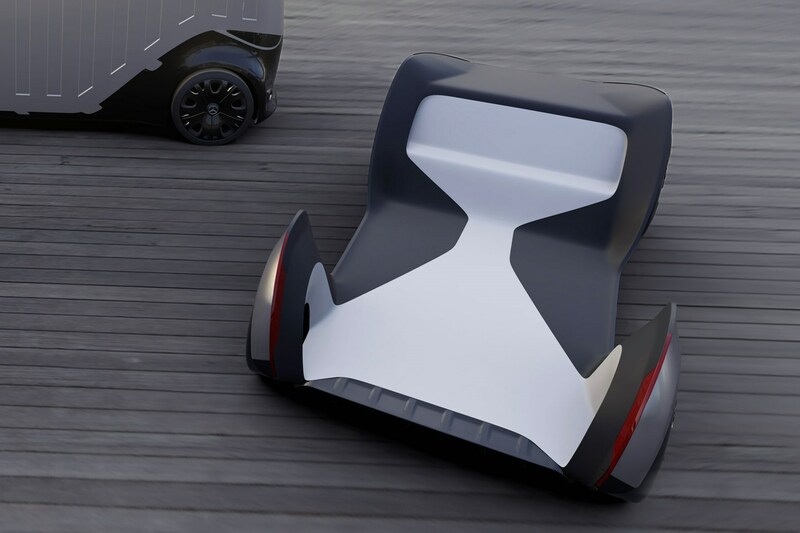 Packing all of its electrical drive componentry into the floor of the skateboard chassis allows the space above to be maximised, whether the Vision Urbanetic is going to be used as a cargo carrier or people mover. Switching between the two configurations can be done manually, but remember, this is a vehicle designed for 2036, so the whole process should be Orwellian and fully automated. Driving itself to the changeover platform, with LED lighting and antennae-like sensors communicating with pedestrians and other road users to let them know what its movements are, the skateboard is docked on a series of hydraulic jacks. Once stable, the slightly elevated chassis’ rear wheels push outwards for access while either the cargo or people-mover module is installed. The whole operation should take no more than a few minutes. Overall, the Vision Urbanetic is 5.14m long, similar to lengthier versions of the current Mercedes-Benz Vito medium van. 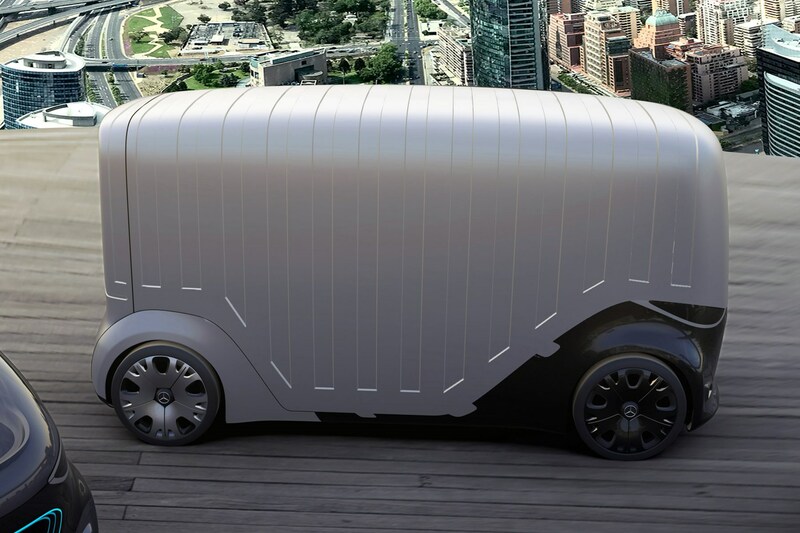 At first glance, the cargo module looks as though a rounded-off shipping container has been dropped on top of a van, but in reality it’s maximising the space on the skateboard chassis. With no need for a driver – Mercedes says that some cities are struggling to recruit van drivers in sufficiently high numbers already – a windscreen, seats and dashboard are all superfluous, meaning the area a driver would ordinarily sit can be given over to cargo carrying duties. Despite those relatively compact Vito-esque dimensions, the Vision Urbanetic’s 10.0 cubic metre capacity almost matches that of some Mercedes Sprinter large van variants (10.5 cubic metres). Better yet, because the cargo area can be configured in a split-level format, it can also hold up to 10 Euro pallets of goods inside – way more than any conventional van of its size. Loading and unloading can also be automated. Should that upper floor not be required, such as when taller loads are being transported, it simply folds away into the side of the bodywork. 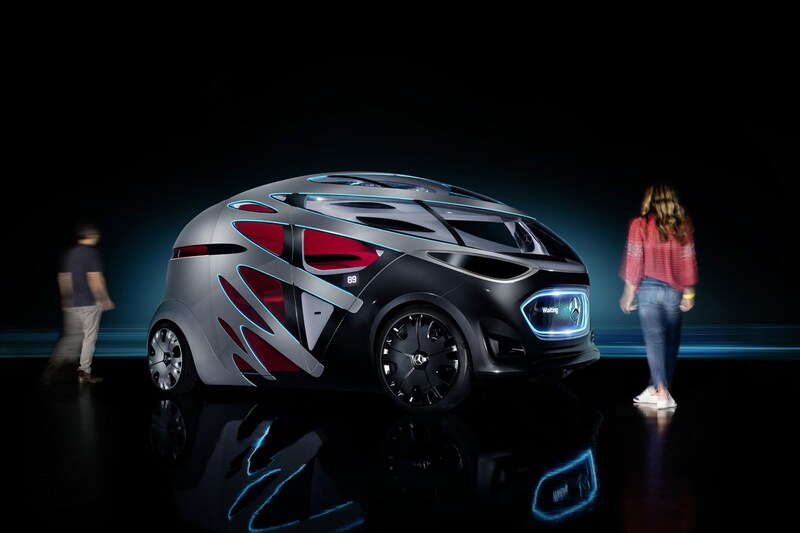 Mercedes is not the first car or van manufacturer to showcase a communal people transporter concept, but it has stolen a march by using a dual-purpose vehicle design. Once swapped to the half-glazed, ovoid body of the people-mover module, there’s space inside for 12 passengers, although that’s standing room only for four of them. Within the people-mover module’s luxurious leather-lined surroundings are a smartphone app-activated mineral water dispenser (yes, you read that correctly) and a roof-mounted 360-degree augmented reality multimedia system displaying all manner of information about the city passengers are in. Outwardly, the Vision Urbanetic communicates with people by a series of display messages and LED lights. Pedestrians on a crossing have a visual confirmation they’ve been seen by way of a text-based display, while those on foot or on cycles have their shapes replicated in light along the flanks of the vehicle. Passengers can request a journey in the Vision Urbanetic by an app (no surprise there), getting picked-up and dropped-off at a series of stops dotted all around a predetermined area of a city. Sounds remarkably like a more personalised bus service, doesn’t it? 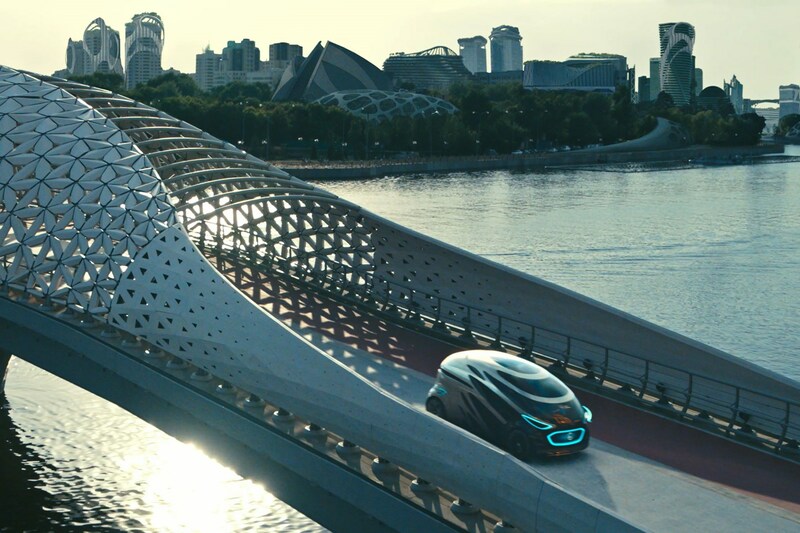 How does the Mercedes-Benz Vision Urbanetic learn about its environment? Something of a leap of faith here: assume for a moment that by 2036 that fully autonomous vehicles will be a reality, using sensors and cameras to determine their way around cities, and the next bit becomes easier to get your head around in terms of plausibility. As the Vision Urbanetic gathers more data about the city and the habits of its users, it can begin to predict peaks in demand, and rather than waiting for passengers to request a journey it can wait at or close to pick-up points in order to reduce waiting times. Similarly, depending upon the specifics of a city’s needs, it might be decided that people-mover modules are required in greater number during the day, while the cargo attachment can be fitted for good deliveries at night. At night the roads will be quieter making the delivery process more efficient, and because the Vision Urbanetic doesn’t require a driver, there’s no need to employ someone for unsociable shift patterns. This, of course, assumes that unloading at the customer’s end will also be automated. When will the Mercedes-Benz Vision Urbanetic go on sale? 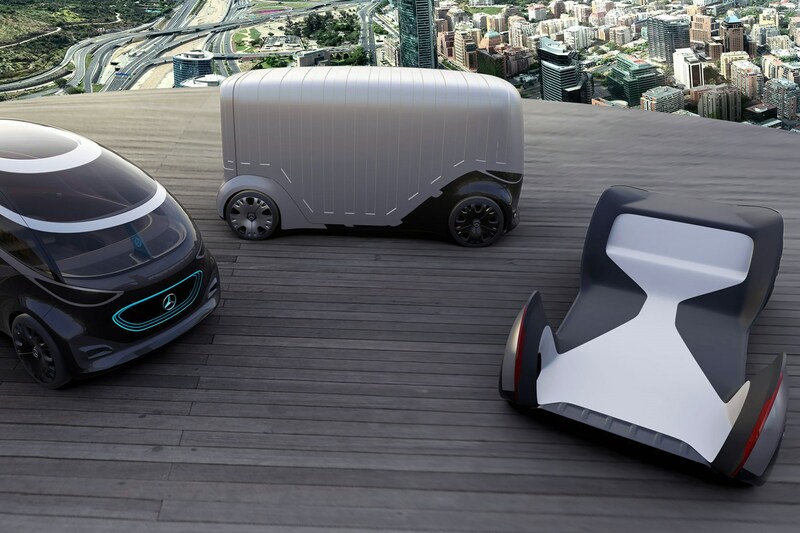 By the time we get to 2036, it’s unlikely whatever vans Mercedes-Benz is selling at that time will look exactly like the Vision Urbanetic, but the technologies it employs are all achievable already – or could be in a relatively short time. The biggest hurdle it currently faces is cost and the economies of scale associated with making those technologies cheaper by making them more commonplace. Currently the combined cost of what is already achievable would make a production version of the Urbanetic prohibitively expensive. To that end, we’re much more likely to start seeing some of the app-based technologies and methods of communicating with pedestrians and other road users on Mercedes’ vans long before we witness fully autonomous commercial vehicles or swappable bodywork.